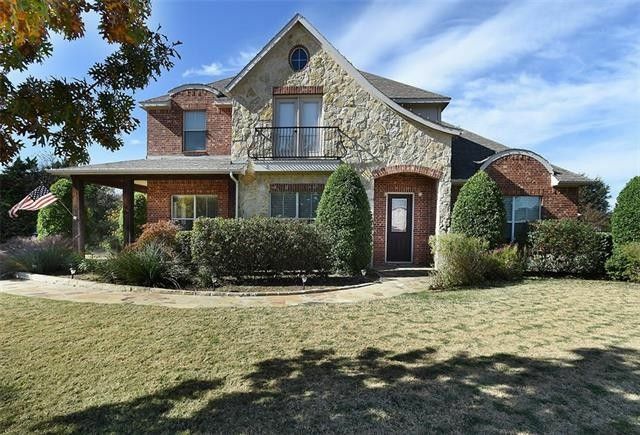 This stately stone & brick home in Cielo Ranch sits elegantly on a .42 acre culdesac lot adjacent to Corps of Engineer property at Lewisville Lake. Built in 2007, the home offers handscraped wood floors, vaulted ceilings, 3.5 bathrms, 4 large bedrms, a study with French doors & wood floors, an upstairs gameroom & media room. Off the big kitchen & formal dining rm, the family rm with 18 ft. ceilings, stacked stone fireplace & double stacked windows for enjoying the 30X20 flagstone patio & firepit in the backyard.The kitchen with ample 42 inch cabinets, stainless appliances & a 5X4 island opens to the sunny breakfast rm with French doors to the covered L-Shaped flag-stoned patio at the home's front. 3-CAR GARAGE. Directions: The home is in Cielo Ranch off Shady Shores Rd. in Shady Shores near Lake Lewisville.